Scots Magazine’s chosen book of the month! You'll be £8.00 closer to your next £10.00 credit when you purchase With Wellington in the Peninsula. What's this? Few men from the 71st Highland Light Infantry who sailed from Cork with Wellington to Portugal in 1808 returned to the Irish port six years later. The author of Vicissitudes in the Life of a Scottish Soldier was one of the survivors and claims only four other men from his company came through the entire six years with him. As one of Wellington's elite Light Infantry units the 71st were in the fore of the fighting in some of the hardest fought battles of the Peninsular War. The book was controversial on its release in 1827 for its unvarnished and unsentimental account of the grim war against the French in Spain, the Netherlands, Portugal and France itself. A cynic with a highly developed sense of humour, the author was not afraid to criticise his superiors, be they thieving sergeants or officers who were far from gentlemen. Editor Paul Cowan draws on little known diaries and other accounts written by the author's contemporaries to corroborate and expand on this frank but all too long neglected first-hand picture of the war in the Peninsula as it was really fought. Few men from the 71st Highland Light Infantry who sailed with Wellington in Portugal returned six years later. The new rendition of this honest tale includes little-known diary entries and other accounts written by the author’s contemporaries, which taken together give rise to a starkly honest picture of war. 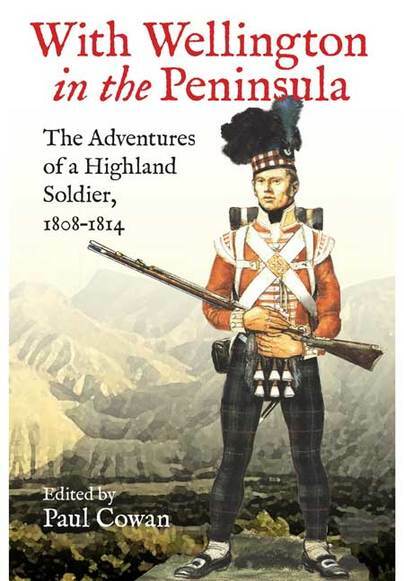 A highly entertaining but thought provoking account of a private in Wellington's Army. If you like the Peninsular Campaign then this is a good tale of the sharp end. It is also a look at society of the early 19th century and why young men took the ‘shilling’. The book is well written and edited, easy to read with some clear informative maps. I would thoroughly recommend this book, it is an honest account of life in the period. I can fully understand why it wasn't overly well received in its day but think that it is the unsympathetic yet balanced nature of the account that make it so valuable now. Life was neither full of horror and death, but neither was it six years of japes and humour. The truth lies between both and this account shows that. Humour can be found in the darkest of situations. The retreat to Coruna is one area where the author(s) doesn’t hold back. Two hundred years after the fact we can look back dispassionately and acknowledge that atrocities were carried out by both sides, but in 1827 it must have come as a bit of a shock to hear how our soldiers behaved and to read about the unsentimentalised horrors of the war with France. This isn’t to say that the account is one of dubious behaviour and tales of horror. There is much humour in this book, with many anecdotes finding me laughing out loud. The interplay between the men on the march had such a ring of truth that I could fully imagine some of the exploits described happening within any group of men. There are tales of captured wine cellars being shared via a timeshare arrangement with French sentries, newspapers being passed between officers (both French and British), stolen chickens and admiration for the carrying capacity of kilts. The editor’s research is shown clearly, starting with a brief overview of the 71st‘s campaign during the period and continuing with many facts to support his view that this was written by two members of the regiment. Excellent footnotes are found throughout the account making this a very easy book to follow. There is enough information at hand to fully appreciate the tale but not so much that the reader becomes became bogged down in facts and figures. I would thoroughly recommend this book, it is an honest account of life in the period. I can fully understand why it wasn’t overly well received in its day but think that it is the unsympathetic yet balanced nature of the account that make it so valuable now. Life was neither full of horror and death, but neither was it six years of japes and humour. The truth lies between both and this account shows that. This is a first-hand account of the Peninsula War by a soldier who was there. First published in 1827, this is a primary source account, that includes material from others who fought in the campaigns in Portugal and Spain. This material has been sensitively edited to produce a new book with illustrations, mainly in the form of maps. The author has written with humour, colour and frankness. It is not a history book or a stiff account written late in life by an old soldier. The text flows and has character. The author attempts to paint a comprehensive picture of a series of campaigns that took British soldiers into France and the defeat of Napoleon. The result is an entertaining and informative story that reads well and will appeal to all who are interested in the period. A very worthwhile book. It is the most candid memoir of the British Army that I have ever read! The author chronicles the daily life of a soldier and does not pull any punches. If you are interested in the memoirs of British soldiers in the Napoleonic Wars this book is a MUST! It is full of life - you can see the real person behind the text and Paul Cowan has done a good job in editing it. If you are interested in military history the same goes, as this is a man who walks through history in front of you, rejoicing, complaining and telling his story. If you are interested in military culture then this soldier delivers the goods in describing in detail his daily life. You don't get many Napoleonic memoirs as good as this. Few men from the 71st Highland Light Infantry who sailed from Cork with Wellington to Portugal in 1808 returned to the Irish port six years later. Editor Paul Cowan draws on little known diaries and other accounts written by the author's contemporaries to corroborate and expand on a first-hand picture of this Peninsula war.